Although we like to indulge in a nightly skincare regime with several products, let’s be real, ain’t no body got time for that at a festival. Enter Simple Kind to Skin Biodegradable Cleansing Wipes, the quick fix cleanse cloths will leave you with fresh, clean skin and a clear conscience as they’re biodegradable. The sustainable wipes are also vegan and fragrance, parabens and alcohol free; so they’re gentle enough to be used on even the most sensitive of complexions. If glitter isn’t your thing, how about coloured mascara? Japanese beauty brand Shiseido has a selection of striking shades from sapphire blue, to emerald-green. 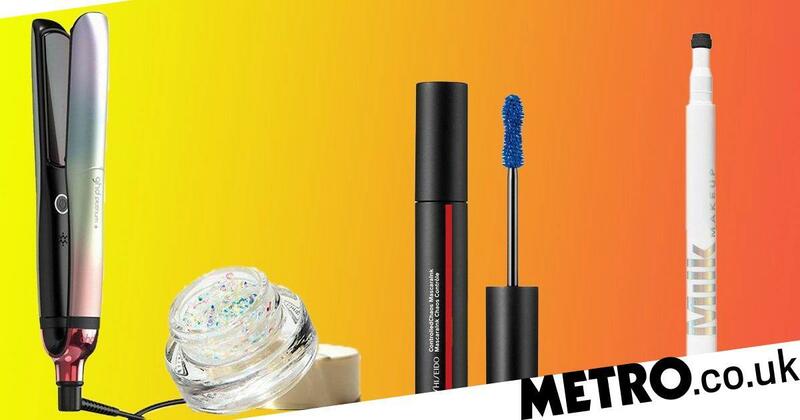 We applied lashings of the Shiseido’s nostalgia-inducing blue mascara and it made our eyes appear wider and brighter. And the purple mascara makes green and hazel eyes look even greener. For a low-key coloured lash look, apply your black mascara as you would usually and try coating just the tips of your lashes for a fun ombré look. Festival season is the perfect time to get creative with your eyes and these makeup stamps from Milk Makeup are so much fun. The nifty ‘tattoo’ stamp pens allow you to add a quick heart, moon, peace sign, star, or two to your cheekbones – or wherever you feel fit – to quickly achieve a simple but bold look to wow the crowds. They’re transfer proof and long-lasting too – so make sure to get yourself a decent makeup remover. If you don’t have time or money to book in for a spray tan before you go, the best instant fake tan is Rimmel Sunshimmer Instant Tan Matte Water Resistant. The wash-off tan imparts an instant glow and veil of believable colour, without any shimmer or glitter, disguising red marks, bruises and pesky razor nicks. And it’s truly transfer resistant. The best part? It’s under a tenner. This multi award-winning tinted moisturiser from NARS gives radiant, even skin in a flash. It also offers advanced sun protection and a lighter level coverage, so you can go light on your base and get creative with eyes and lips instead. Better yet, the do-it-all beauty product is oil free, which is ideal if your festival is scheduled bang smack in the middle of summer, as it will help reduce shine. Wave goodbye to matte lips this festival season and say hello to your new favourite lip product, Fenty Beauty Gloss Bomb Universal Lip Luminizer. The now iconic gloss from Rhianna’s makeup line looks gorgeous on the lips, imparting a wash of shimmer with a high-shine finish, without feeling sticky. This holographic highlighter from Milk Makeup shifts in color with changes in light and will look enchanting when you’re bobbing along to the music. The twist up stick highlight comes in three magical shades; holographic lavender, golden peach, and pink and can be applied to lips, cheeks or even eyes.